As seen on Saturday Night Live, Jimmy Fallon, at NASA, Disney, MIT & more! Ahh...That's my bean bag design! Even though AHH Products offers hundreds of bean bags with washable covers plus water-repellent liners, you may still not find exactly what you're looking for. So, we also offer custom ordering! Custom order bean bag chairs come complete with removable covers made from your fabric, and water-repellent liners full of bean bag filler. Send us your own bean bag fabric and we'll make the bean bags for you! Match your home decor perfectly. It's also a great way to use fabric that you have lying around or take advantage of fabric store sales in your area. *If you send fabric that is short, we will notify you. In most cases, we will still be able to use your fabric, but the bean bag will be smaller than the usual size depending on how short the fabric is. *For the 37" size only: If your fabric is 54" - 59" wide, and you do not want to send in 5 yards, you can send in 2.5 yards. We will make the bean bag as large as possible using the 2.5 yards. In most cases, the change in size will not be extremely significant, but it will be smaller (averaging about 34"-35" wide instead of 37" wide). *It is preferred that you send (1) continuous piece of fabric: Contact us if you cannot send (1) piece, there may be exceptions. *Please mark the face: If it is not obvious which side is the face/front, please mark the face with tape or other method. If not marked, we will contact you if there is a question. However, if not marked, and we thought there was an obvious face (in which case we will not contact you), we will produce the bean bag cover using that face side. If you disagree after receiving the product, it is still considered a Final Sale. If you send the cover back to be resewn, the manufacturing cost will be an additional $85 per cover. *Insurance: If you want to insure your custom order for the value of the fabric, please contact us before placing your custom order to discuss your needs or purchase extra insurance during checkout. If a claim must be submitted because your fabric was damaged in transit, we will require proof of value to submit to the shipper per shipper's requirements. We have no control over what the shipper ultimately reimburses you for your fabric and are not responsible for reimbursing you if the shipper fails to do so. Please purchase the insurance amount that will adaquately cover your total fabric cost. If you do not purchase additional insurance, and your fabric is damaged in transit to you, we will not be responsible for replacing it. We will re-manufacture the order at no additional charge if you send replacement fabric. You MUST keep the damaged item, including the original box, available for inspection by FedEx so that we can put in a claim for damaged items . If you do not have the item/box for inspection, you will be charged for that item as if it were not damaged and any replacement will be treated as a new order (since we cannot put in a claim with FedEx). These tennis ball bean bags were custom-made for a gym - give you any ideas?! 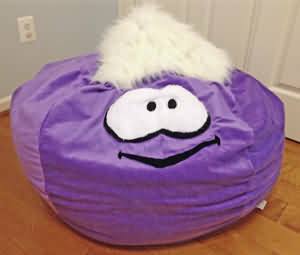 We custom-made this Puffle bean bag chair for a very happy little girl! 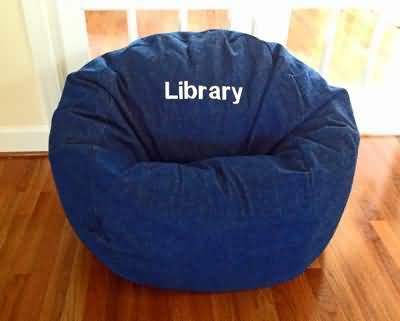 A bunch of these bean bags were personalized for a library.